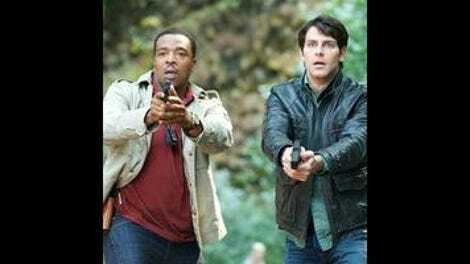 Last season on Grimm, one of its best installments was the episode “Cat and Mouse,” a late entry which balanced its case of the week—a journalist/resistance leader fleeing an hound-like assassin—with the first real substantive information on the show’s universe. It introduced the concept of the Verrat and the Seven Houses, a world-spanning Wesen organization with strong connections to Renard and the mysterious Reapers who triggered Nick’s Grimm awakening in the pilot. The reveal meant that for the first time, rather than sticking to cryptic references and unconnected phone calls, the actions of the epiode had a sense of a broader scope. It was an indication that the modern world of the Grimms and Wesen extended far beyond Portland, and that neither Nick or Renard was operating in a vacuum. That all changes in “Season Of The Hexenbiest” however, an outing that’s firmly grounded in the larger world of the show. It presents the return of the mysterious key that Nick’s mother promised was part of a larger puzzle dating back to the Crusades, the Verrat’s merciless Hundjäger enforcers and the most direct involvement by the Seven Houses in Portland events to date. And perhaps not coincidentally, it also happens to be the best episode the show’s done all season (“La Llorona” being a close second), an episode that uses this larger world as an impetus to push several characters out of their holding patterns, where things are said and seen which no one can take back. The catalyst for all of this change is none other than Adalind Shade, the Hexenbiest made human by Nick’s blood, one-time girlfriend of Hank and former employee of Renard. Now in the employ of Renard’ s brother Eric—who’s cementing his power by killing off rivals that include Renard’s European allies—Adalind comes to Portland with a quartet of Hundjäger at her command, issuing a demand to both Nick and Renard to procure the key within 48 hours. She plays both a personal and psychological game with the two, getting under Renard’s skin by threatening his exposure, and getting under Nick’s skin with a few choice meetings with people close to him. Claire Coffee was promoted to series regular earlier this season (their second addition after Bree Turner) but she’s been almost nonexistent in the main story, limited to the occasional threatening call with Renard or clandestine European meeting with Eric. Here, Adalind’s front and center, and the increased screen time reveals a much better character than she was in the first season when she was Renard’s love-struck henchwoman. One minute she casually flirts with a skeptical Hank, the next she’s sending her henchmen to beat him senseless; she can have a seemingly earnest conversation with Juliette over tea and then sneer at Renard’s apparent lack of control. There’s a palpable enjoyment to Coffee’s performance as Adalind plays her mind games—particularly in her interrogation scene with Nick, a mix of alibis and veiled threats—with a wide smile that’s meant to seem friendly but is two fangs short of betraying its true nature. “You don’t have to be a witch to work this kind of magic,” she taunts Nick through the confines of her bars, in possession of a confidence that none of her adversaries seem to share. Like Kevin, I’ve been catching up on Buffy the Vampire Slayer over the last few months, and one of the things that struck me in the early going of that show is the clear qualitative difference between standalone and serialized episodes. The episodes that involved the Master, Spike or Angelus were the best installments of those first two seasons, because the continuity of those episodes raised the stakes for Buffy and demonstrated the show’s villains were more interesting if they weren’t killed off after one week. David Greenwalt would be well-advised to consider that benefit for his current show, and if Grimm goes in this direction—setting up Adalind as the Big Bad for the remainder of the season, commanding the resources of the Seven Houses as its agent in Portland—that’s a decision that would only benefit the show, and a role Coffee proved in this episode she’s capable of handling. That direction plays into one of Grimm’s more subtle adjustments this season, the increasingly dark path Nick has been on. Ever since his mother’s reappearance and disappearance he’s been more willing to play the vigilante role, his efforts to balance being a police officer and a Grimm now tilted heavily in favor of the latter. He’s disposed of incriminating evidence, shown up at suspects’ homes with a crossbow instead of a search warrant, and defied the will of authority figures all the way up to the district attorney. Here, Adalind’s meddling and the continual fracturing of his relationship with Juliette are pushing him even further, and the rising tension continues to draw a better performance out of David Giuntoli, even making him reasonably convincing as an action hero. Case in point: Monroe leads the Verrat to a secluded location and asks Nick “You wanna arrest them or what?” and Nick responds “Or what” in a tone that brooks no argument, with “or what” involving beating the attackers to death. It’s great to see Nick and Monroe working together again so closely after Hank supplanted the latter, and it looks like we’ll be getting even more of it now that the two are roommates—Nick having finally realized that the status quo at home can’t remain as it is and moved out. It’s a pairing that pays dividends almost immediately in the last few minutes: Monroe has a press conference recorded on his TV (the same conference from “The Hour Of Death,” in a nice bit of continuity) and plays it for his houseguest to provide the last piece of context. Now Nick knows who the other man is, and can make the identification Monroe can’t. And he’s not the only one of Grimm’s main cast whose previously established norms have been shattered as the show heads into its winter break. Hank’s in the hospital, now knowing that as much as Nick’s been willing to tell him there are still some secrets he’s not privy to. Juliette now has the house to herself, and no more reason to connect with a man who’s a virtual stranger to her. And Renard stands in front of Aunt Marie’s Airstream trailer, which may not contain the key but does contain centuries of resources a rogue noble could find incredibly useful. Could some or all this be abandoned or delayed when the show returns, in favor of more cases of the week populated with more increasingly outlandish Wesen? It’s possible, but I hope Greenwalt and company are smart enough not to do that. This flavor of Grimm—dark, personal and committed to its mythos—is the show I’ve always hoped it could be. This Week in Portland, round one: Food fight! Or rather, a fight within a food cart pod, as the final battle between Nick, Monroe and the Verrat takes place in one of Portland’s most characteristic eating locations. The location doesn’t match a particular pod in town, but recognizable amongst the carts are such Portland standouts as Blues City Biscuits, The Gaufre Gourmet and Violetta. This Week in Portland, round two: In the comments last week, DeLaNoche correctly observed that there is no Fulton Street in the Pearl District, rendering the address Renard gave for the spice shop irrelevant. However, the street view as Juliette flees finally solidifies the location: Northwest 2nd Avenue between Couch and Davis, in the heart of Old Town Chinatown. No Rosalee this week, but by the time the show returns Bree Turner should be back full time. It’ll be good to have her playing an active role again, and will be interesting to see her reaction to Monroe’s newest houseguest. I loved the “To Be Continued… Sorry” card at the end of the episode. Betrays a sense of humor on the part of the showrunners I find comforting. Thanks again to Kevin for letting me cover these last two weeks. It’s always a pleasure to talk about this show, and I hope I’ll be back to discuss it again at least once before the season ends.